More than 300 researchers from around the world will travel to UC San Diego next month for an international meeting designed to showcase new biological and chemical approaches to utilizing solar energy for direct fuel production. Officially billed as the second biannual International Solar Fuels conference, the scientific meeting is being held on U.S. soil for the first time. Organizers of the first conference, held two years ago in Uppsala, Sweden, chose UC San Diego as the venue for the second solar fuels conference because of its leadership in algae biofuels and artificial photosynthesis research—specifically the work of Stephen Mayfield, a professor of biology, and Clifford Kubiak, a professor of chemistry and biochemistry. 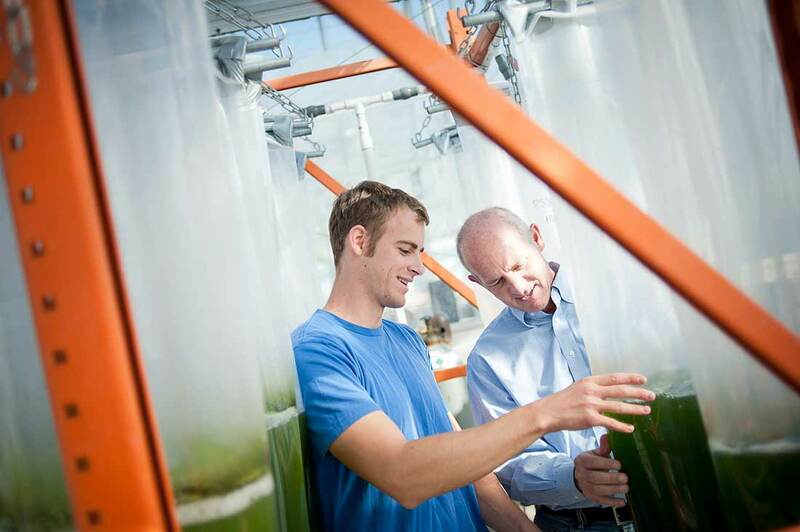 Stephen Mayfield, at right, with green algae growing in bags in a campus greenhouse. 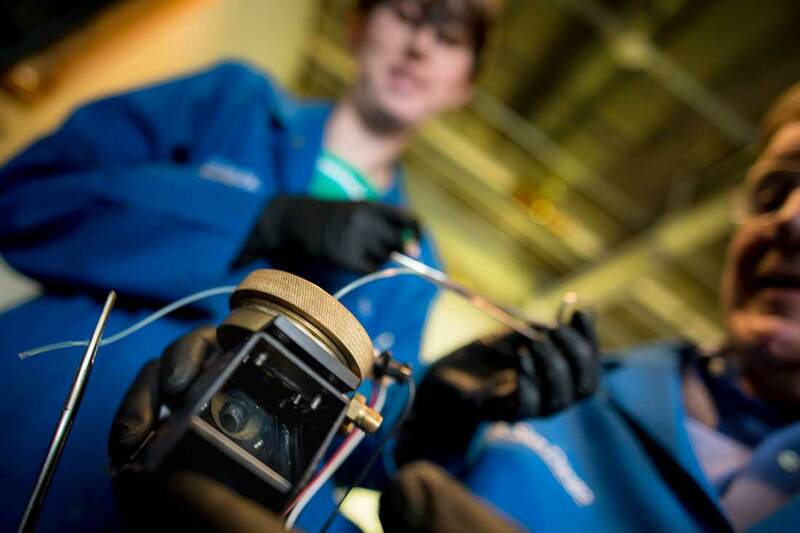 While progress in this area of research is moving ahead at a rapid pace toward commercialization, organizers of this year’s conference, co-sponsored by the U.S. Department of Energy’s Office of Energy Efficiency and Renewable Energy, concede the meeting comes at particularly challenging time for U.S. researchers in the field. That’s because the Trump administration last month demanded that Congress slash DOE’s energy efficiency and renewable energy programs by a massive 70 percent in the fiscal year beginning in October—a blow that, if enacted, will put the United States at a severe disadvantage in developing new clean and renewable energy technologies such as solar fuels. “The Administration’s budget proposal would put us behind China and Europe, blunting our competitive edge in a multi-trillion dollar developing clean energy global market,” said former U.S. Secretary of Energy Ernest Moniz, now a professor of physics and engineering at MIT. Among the topics discussed at the upcoming meeting will be ways of chemically producing energy through artificial photosynthesis, catalysis and electrochemistry, as well as biological approaches of producing clean energy, such as genetic engineering pond scum to produce high quality algae biofuels. Mayfield and two professors in UC San Diego’s Department of Chemistry and Biochemistry, Michael Burkart and Skip Pomeroy, are working on a variety of research projects designed to make the production of transportation fuels, as well as other petroleum-based products, from algae commercially viable. Green algae flowing into an outdoor pond at UC San Diego’s field station is being used to develop a better biofuel. Kubiak, meanwhile, has been working in his Pacific Hall laboratory on several ways of chemically mimicking the process of photosynthesis and using sunlight with a semiconductor and two thin layers of catalysts to “split” carbon dioxide into oxygen and carbon monoxide. Millions of pounds of carbon monoxide are used each year to manufacture chemicals, including detergents and plastics. The molecule can also be converted into a liquid fuel. The device developed in Kubiak’s laboratory splits carbon dioxide to generate carbon monoxide and oxygen in a three-step process. The first step is the capture of solar energy photons by the semiconductor. The second step is the conversion of optical energy into electrical energy by the semiconductor. The third step is the deployment of electrical energy to the catalysts. The catalysts convert carbon dioxide to carbon monoxide on one side of the device and to oxygen on the other side. Kubiak said that researchers in the nascent discipline of solar fuels are beginning to form small businesses from their laboratory discoveries. 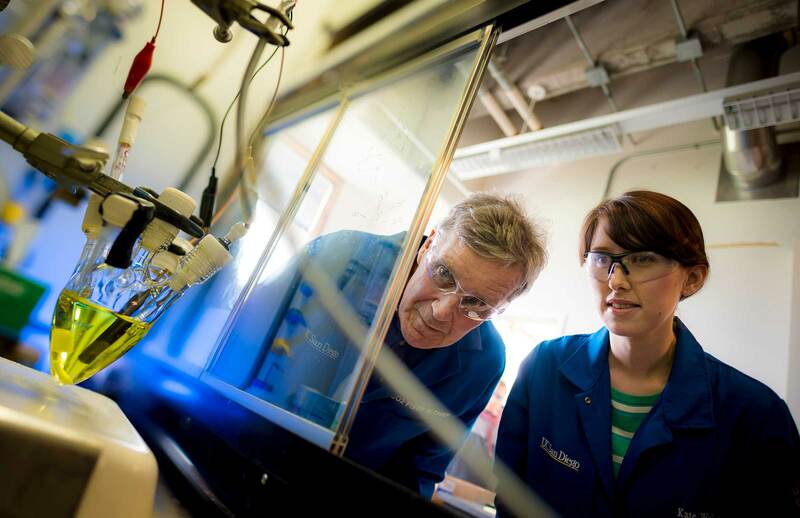 Chemists Kate Waldie and Clifford Kubiak, at right, test catalysts used to chemically mimic the process of photosynthesis. It’s also why maintaining the federal investment in solar fuels and other renewable energy research is so critically important now for U.S. industry.